Below, we shed light on what Magento 2 Visual Merchandiser is and how to work with it. The article discusses how to find the instrument and organize products with its help. Besides, you will find out how to import and export Magento 2 Visual Merchandiser data. Let’s define the instrument first. Being a set of tools for product management, Visual Merchandiser allows positioning products and applying conditions for determining the structure of the category listing. 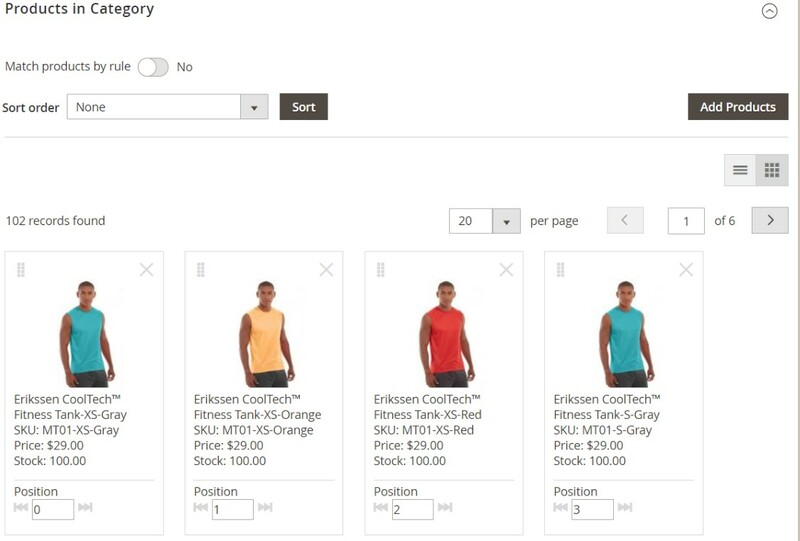 As a result, you can create a dynamic selection of products adjustable to changes in the catalog. Of course, Visual Merchandiser dramatically simplifies your backend routine as well as opens much wider opportunities than anytime before. Due to the visual mode, it is no longer needed to hire specialist for a series of tasks. With Visual Merchandiser, you get a grid that contains all products as tiles. Alternatively, it is possible to work from a list of products in the category. Despite the selected mode, Magento 2 Visual Merchandiser offers the same tools. Use buttons in the upper-right corner of the corresponding screen to toggle between each display type. Now, when you are familiar with the core functionality of Visual Merchandiser in Magento 2, we should describe how to access it. Under Admin sidebar -> Catalog -> Categories, find a category you want to edit. 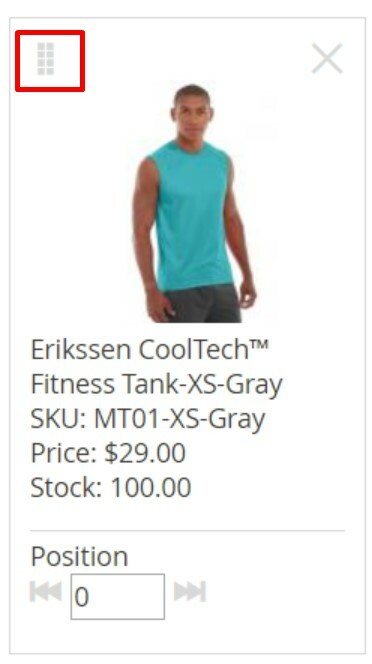 Now, you have to scroll down and expand Products in the Category section. Then, to display the products as a grid, click the View as Tiles button. Now, you can edit the frontend appearance of your catalog. Don’t forget to tap Save Category when complete. However, first you need to visit general settings of the Visual Merchandiser that can be located under Stores > Configuration. To access general settings of the Magento 2 Visual Merchandiser navigate to Stores > Configuration > Catalog > Visual Merchandiser. Visible Attributes for Category Rules – defines which product attributes can be used for filters in categories. For example if you want to include in the category only winter wear, you may want to click ‘Climate’ attribute as visible. Minimum Stock Threshold – defines on which stock level the products should be considered of ‘low stock’. This number is used for the Visual Merchandiser category filters that refer to the product stock. 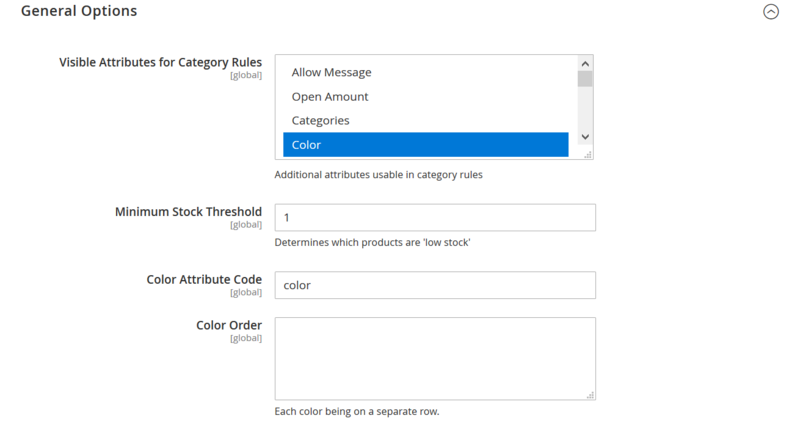 Color Attribute Code – if you are using custom attribute for product ‘color’ you need to specify its code here for Visual Merchandiser would consider it instead of default ‘color’ attribute. Color Order – here you can manually specify the values of your color attribute in order they should be displayed at the category pages. Once you are done with general settings you can proceed to configuring Visual Merchandiser filters for your product categories. The drag control is available in the upper-right corner of a product tile. Use it to drag and drop the product into a new position. Note that the number of each product at the bottom of a tile adjusts to display the new position automatically. There is also the Position field we’ve just mentioned above. While you drag and drop a product tile, the position number adjusts automatically, but you can do that manually without moving a product tile via the drag control. Enter a number where you want the product to appear. Note that the number zero places a product at the top of the category list. It is also necessary to mention that Magento usually reserves the category ID 2 for the root catalog of the default store. It means that Visual Merchandiser can use categories with an ID number of 3 or greater. As you might have already guessed, it is impossible to import and export Magento 2 Visual Merchandiser data with the help of the default platform’s tools. Luckily, there is one user-friendly solution available in the ecosystem. Since it has always been challenging to find a reliable import/export extension suitable for all business needs, we’ve decided to develop our solution. Most tools are still limited to import or export processes only, some of them transfer a limited number of entities, others lack such features as automation or mapping. All these drawbacks motivated us to create our module. Meet the Improved Import & Export Magento 2 extension – our solution for all import and export tasks related to your e-commerce store. Being a number one time saver when it comes to data transfers, it allows you to move most Magento 2 entities including Visual Merchandiser data between your store and external platforms. Visual Merchandiser feature is available for products sorting in categories. That’s why there is no dedicated import entity named ‘Visual Merchandiser’ in the Import Jobs. Instead we use ‘Products’ entity. When importing products you can specify the display priority of the products in the particular category. When importing products for Magento 2 Commerce you can now specify product position in the categories using categories_position attribute next to categories attribute. As for the Magento 2 Visual Merchandiser data export, the process is entirely the same. You can configure it under System -> Improved Import / Export -> Export Jobs. Now, when you know how to import and export Visual Merchandiser data in Magento 2 with the help of our module, we should also draw your attention to the extension’s features, that improve other processes related to data transfers. Since we’ve been working within the Magento ecosystem for years exploring its needs, the Improved Import & Export Magento 2 plugin offers lots of benefits and advantages that enhance the default functionality of the platform. Our extension has already become a number one time saver for hundreds of merchants all over the world. Anyone who faces integrations, data transfers, and synchronizations with external systems, can dramatically enhance corresponding daily duties with Improved Import & Export. You will definitely enjoy the revamped experience our module offers. Let’s start with the automation of data transfers. 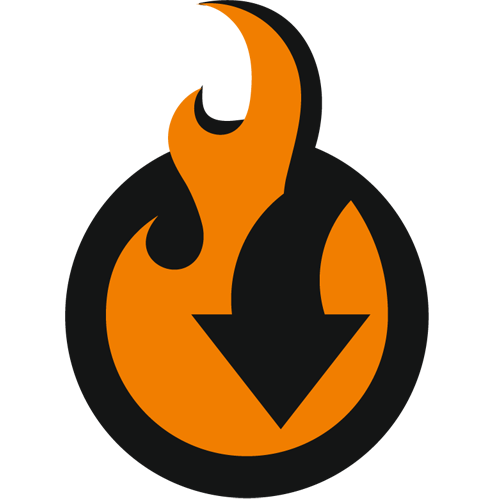 The Improved Import & Export extension offers two ways of data transfers automation. First of all, you can rely on update schedules. Next, it is possible to use event-based triggers to launch import and export processes automatically. This feature of the Improved Import & Export Magento 2 extension is based on cron. If you want to automate data transfers, our module offers several options. Firstly, you can easily create custom update schedules via the default cron syntax. Secondly, our extension enables you to select the most suitable interval from a list of predefined values. But don’t forget that every range can be customized despite it is offered as a predefined interval. At the same time, the Improved Import & Export extension lets you simplify transfers of Magento 2 Visual Merchandiser data using profiles that have no schedules. If specific integrations are random or asynchronous or you want to transfer Visual Merchandiser data only once, use no schedule running related data transfers manually. Furthermore, it is possible to launch every scheduled profile asynchronously whenever you want. As mentioned above, you can use event-based triggers in addition to schedules. The alternative method of running import and export processes offers improvements required to enable real-time updates and data transfers. But it is necessary to specify a proper trigger. Let’s assume that an event when a customer places an order is a trigger. It launches a new export process that transfers order data to a specified platform. Thus, the Improved Import & Export Magento 2 extension enables instant import or export procedures. With the Improved Import & Export extension, you can use both system and custom events as triggers. After a trigger is defined, specify conditions to make its work more efficient. For further information about this feature, follow this link: How to Run Magento 2 Import or Export After Specific System Event or Process. While you cannot transfer information from Magento 1 to Magento 2 directly, it is even more difficult to connect our favorite e-commerce platform to external systems. The problem is caused by different standards used for storing and organizing data in every system. 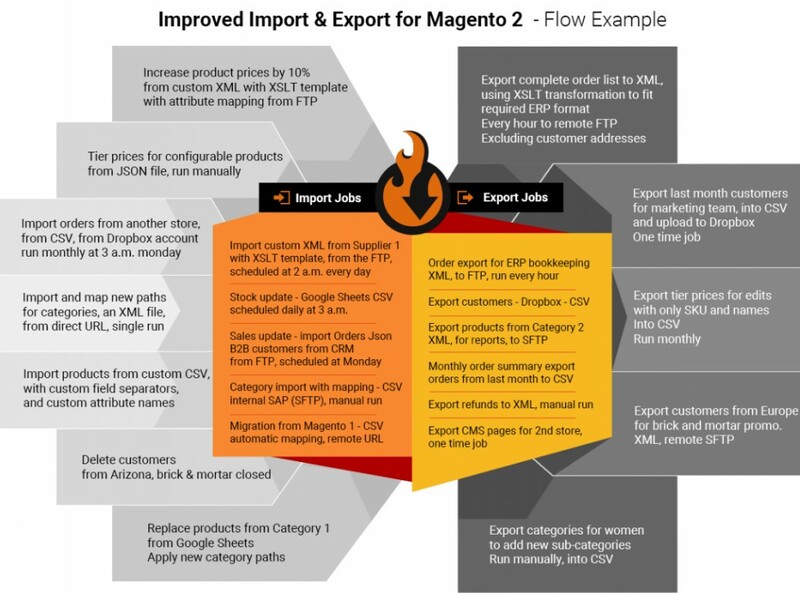 Consequently, a seamless connection between your Magento 2 website and an external platform is hard to achieve unless you use the Improved Import & Export Magento 2 extension. Below, we shed light on how our module solves the problem. With our extension, you will solve the problem of different attribute standards within a few clicks. Improved Import & Export offers multiple mapping presets designed to match external designations to the corresponding internal ones in a matter of seconds. It is only necessary to select and apply a preset related to your integration to let the module do all the work for you. It analyzes the input data matching all third-party attributes to the corresponding ones used within your Magento 2 database. In the third column that is untouched in the example above, you can set hardcoded values for all items bound to the attribute. For instance, the “Default Value” column lets you import products from different store views but direct all of them to a single one instead. Specify a corresponding store view value. And you can map attribute values in the same way as mentioned above. The Improved Import & Export Magento 2 extension reduces headaches related to external designations even in this area. Although attribute values usually don’t prevent import processes, there are always several exceptions. At the same time, they require lots of time and effort for editing after the update is made. Unfortunately, we cannot provide presets for attribute values since it is a very individual aspect of every website, but you still get a user-friendly algorithm for their matching. The solution provided by the Improved Import & Export Magento 2 module lets you choose a third-party designation and specify the internal one in front of it. For further information, follow this link: Attribute Values Mapping. With our extension, you can combine these rules and create conditions to increase their efficiency. Follow this link for more information: How to Modify Attribute Values During Import and Export in Magento 2. If necessary, it is even possible to create new categories on the fly. The process is as easy as selecting a parent category and specifying the name of a new one. That’s it! Both features are described here: Category Mapping. The full process is described here: Product attributes import. The standard data synchronization between Magento 2 and other platforms is based on data files, but you are not limited to them with the Improved Import & Export extension. Our module offers several more ways of creating a bridge between your e-commerce platform and external systems. Furthermore, it enhances the standard data file transfers opportunities by introducing new file formats. Let’s describe the improved file transfers first and then proceed to more sophisticated ways of transferring data. It’s not a secret that Magento is bound to CSV files only. For some purposes, the only file format is enough, but multiple more integrations require other standards. Fortunately, the Improved Import & Export Magento 2 extension radically increases the number of supported formats. Thus, you can freely transfer XML, JSON, ODS, and Excel files via our tool. And don’t forget that the Improved Import & Export Magento 2 extension extracts compressed data automatically, so you don’t need to do that manually before every update. As for more sophisticated ways of import and export, they are represented by API integrations. Use one of the following standards to synchronize your e-commerce store with external systems: REST, SOAP, and GraphQL.